TT is a permanent general purpose Label Stock consisting of Thermal Transfer Paper, a rubber based general purpose adhesive, and a 40# Kraft release liner. The label stock exhibits high tack and ultimate adhesion properties designed for general purpose label applications, used in Thermal Transfer Printers. A thermal transfer printable label face paper designed for general thermal transfer barcode printing. Can also be flexo printed. 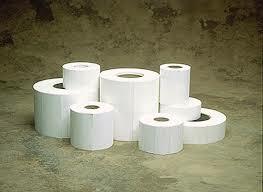 A hot melt pressure sensitive adhesive designed for general purpose paper labels. Excellent adhesion to a wide variety of substrates.